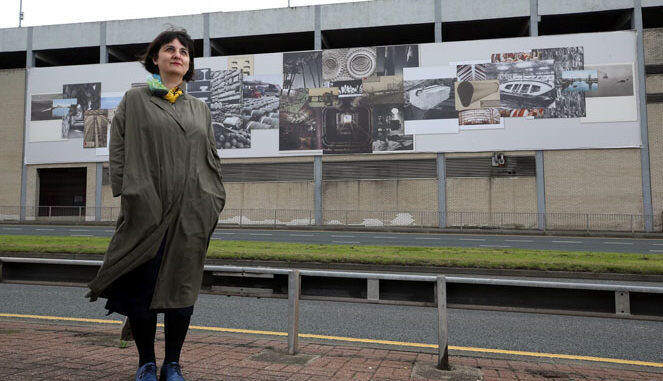 A new landmark artwork by acclaimed artist Aikaterini Gegisian has been formally unveiled at Stockton’s Castlegate Shopping Centre. The commission is the result of collaboration between Middlesbrough Institute of Modern Art (mima), Ellandi and Angelo, Gordon & Co, the owners of Castlegate Shopping Centre, and Stockton-on-Tees Borough Council. Gegisian was proposed, along with four other artists, by mima’s senior curator Miguel Amado and assistant curator Giles Maffett to produce a work for Castlegate Art, with representatives of the commissioning organisations concluded that Gegisian was the most suited artist for the project. Following a period of research and engagement with local residents, Gegisian has created Turn Back Tide. The work suggests the evolution of central Stockton-on-Tees from an industrial past towards its current status as a hub of trade and service provision. Turn Back Tide acts as a bridge between the former sites of production surrounding central Stockton, the river as a historic route for the transportation of goods and natural resources, and Castlegate Shopping Centre as the present container of goods. Gegisian, who spends her time between Middlesbrough and Thessaloniki in Greece, took as her starting point a series of product catalogues from various former local factories, including South Durham Steel and Iron Co and Head Wrightson. She brought together diagrams of steel sections from these publications with copies of archival photographs of local factories, and contrasted these images with views of shopping centres, depictions of ancient temples and reproductions of decorative objects. Castlegate Art provides a new art platform for Teesside, with the commissioners keen for the project to have a community-oriented focus, and situate it with its constituents, who are the customers of Castlegate Shopping Centre. They also want to widen the scope of the commissioned artists, who may work with all sorts of media and engage with ideas rather than just studio-based activity. Turn Back Tide can best be viewed from the pedestrian bridge on Riverside Road, Stockton-on-Tees, adjacent to Castlegate Shopping Centre.